Kathryn has a diverse background in engineering and science education. She is currently working at the University of Colorado in the Science Discovery department. Her main focus is on high school programming at the University. Outside of work, she loves living in Boulder with her husband and two children. They enjoy camping, hiking, and mountain biking as a family; in addition, she loves soccer, volleyball, cross-country skiing, and tinkering. 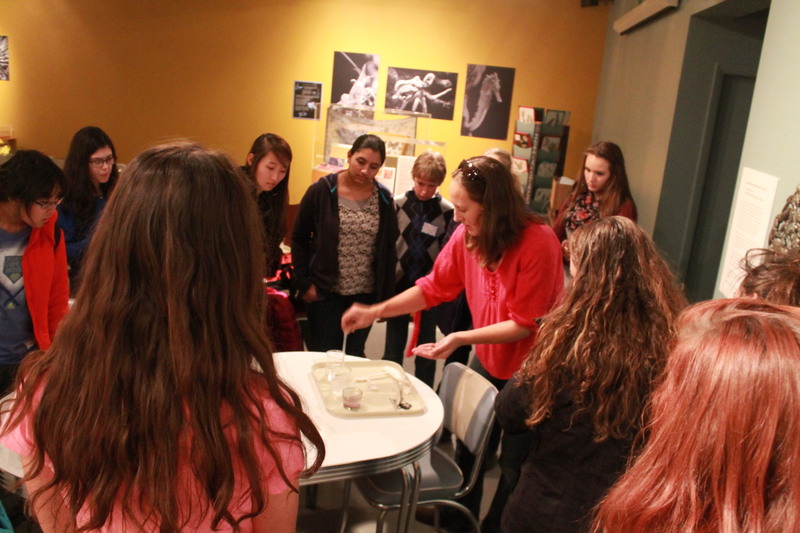 Kathryn is conducting an experiment while teens gather around her at a recent Teen Science Café in Boulder, Colorado. 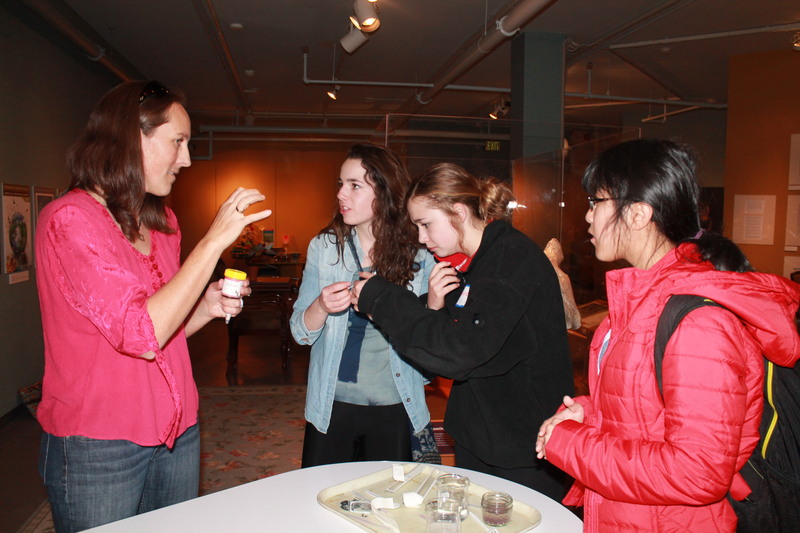 Our Teen Café’s home is the BioLounge at the University of Colorado Museum of Natural History. This location is easy to access via local bus routes, which allows for teens to easily get to and from the Café. I think what’s most special about our café is both the strong teen leadership team and the ability to tap into a diverse range of research being done on the CU-Boulder campus. Our teen leaders take a real pride in the program and are good at recruiting their friends to attend. Being on campus and being connected to the CU Science Discovery Program, we have a lot of opportunities to engage with researchers in a very wide range of disciplines. My background is in Chemical Engineering. I received my PhD in that field and worked on developing new gene therapy techniques for bone regeneration. However, I’ve always had a love of science communication and outreach, and when I found CU Science Discovery, I knew I had found my home. I started working at Science Discovery as an instructor and was quickly recruited to expand our high school offerings and developed my own programs. I currently run high school programming in the summer on the CU-Boulder campus, where we offer a3-week courses and a 4-week research experience. During the school year, I run our Portal to the Public program, where we train scientists to communicate with public audiences, along with helping with the Teen Café program. I love working in science communication, where I get to be the interface between cutting-edge research and teen audiences. 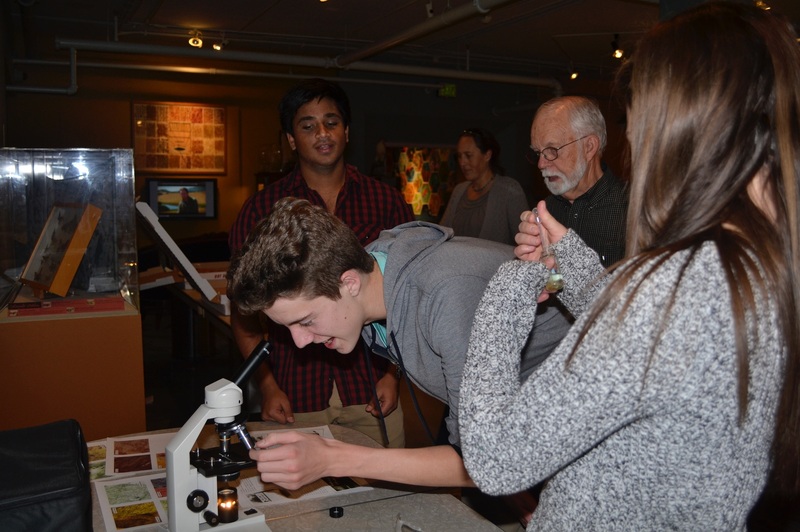 Teens using a microscope at a recent Teen Science Café in Boulder, Colorado. Our Teen Café program is housed within the Science Discovery program here at the University of Colorado. Our partnership with the university is strong and allows us to tap into cutting edge research to share with our teens. We also have access to graduate students who are excited to share their work in our Teen Café setting where they get to practice communicating their work to others. The mission of Science Discovery is to excite people of all ages to explore STEM topics and the Teen Café fits perfectly with this mission. In addition, our teens get exposure to CU researchers who have the opportunity to impress and recruit new CU students. Out biggest stumbling block is recruiting a diverse audience. Since we are housed in Boulder, most of our teens come from a few major high schools in the area. We would love to reach a more diverse audience, but recruitment of those students has been slow. Word is spreading, but it’s been slow. Kathryn explaining the science behind the hands-on activity to a group of teens. It’s really hard to pick a favorite. Every Café I attend is so interesting and opens my eyes to a field of study I may not have been aware of. If I had to pick I would say, Dr. Hunter Ewen, who is a Professor of Music, gave one of my favorites. He gave a talk on the Architecture of Music: Reimagining Live Music Through Artificial Intelligence, Electronic Body Suits, and Computers. What was fascinating to me, and I think to our teens as well, was Hunter’s story of how he got into his field. Going into college he thought he had two choices: become an engineer and be unhappy, but make money, or become a musician and be happy, but always poor. However, once at the University, he came to realize that the two were not mutually exclusive and that his two passions could be combined. He now works at a fascinating interface of engineering and music; this was a joy to hear about. I love the wide variety of speakers we have and the energy that the Teen Leaders bring. There is nothing better than learning something new, and I’m always fascinated to hear about the exciting research going on all around me. My advice to new Cafés would be to be open and flexible with your format and speakers. Listen to your teens and what their interests are and you will have a more successful Café experience. Thanks to Kathryn Penzkover for the time!